Transforming Transportation 2014 kicked off with an opening plenary titled, “Shaping the Future We Want: A Conversation with City and Corporate Leaders.” Photo by Tommy Vohs/Flickr. All Rights Reserved. EMBARQ, the sustainable urban transport and urban development program of the World Resources Institute (WRI), and the World Bank are co-organizing Transforming Transportation on January 16 and 17 in Washington, D.C. Join the conversation on social media with hashtag #TTDC14, by following @EMBARQNetwork and@wbsustaindev on Twitter, and tune-in to www.transformingtransportation.org for video streaming of select sessions. Five plenaries, ten break-out sessions, 90 speakers, and nearly 1,000 registered participants – Transforming Transportation 2014 is underway at the World Bank headquarters. This conference is an opportunity for leaders in the transport, development, and for the first time, business leaders to raise the necessary questions and hone in on the issues where urban mobility can be a solution in the international process that will shape the economic, environmental, and social sustainability for decades to come. Urbanization is the challenge of the 21st century. More than 3.5 billion people currently live in cities, and by the end of this century that will climb to 90% of the global population. We need to provide 21st century answers. We are at an exciting time internationally. Sustainable cities and sustainable transport are now part of the global framework for action, and we need to get this right. We can’t wait. He also stressed that transport provides access to jobs, education, healthcare, and more. Irigoyen expanded this vision of sustainable cities and transport on the ground: “Can we imagine a day where a worker will walk with pleasure through a pedestrian area rather than walking along dangerous roads polluted with garbage from a slum to a low-paying job?” Finally, the pair emphasized the five opportunities for 21st-century transport identified by the co-organizers and partner organizations of Transforming Transportation 2014: road safety, mid-sized cities, regional and local governance, finance, and data and technology. These are the five critical themes that the two-day conference will focus on and explore. 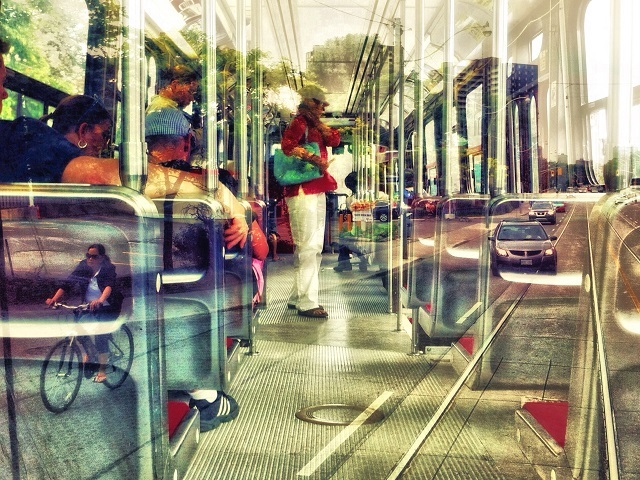 Why is 2014 a critical year for Transforming Transportation? First, this year marks the first time businesses leaders have been invited to play a major role in the conference. And today’s opening plenary, “Shaping the Future We Want: A Conversation with City and Corporate Leaders,” reflected the importance of the private sector in this year’s agenda. Second, several major milestones loom ahead this year and next: the 20th and the 21st Conferences of the Parties (COP 21) to the United Nations Framework Convention on Climate Change (UNFCCC) in Lima in 2014 and Paris in 2015, as well as the definition of Sustainable Development Goals (SDGs). These key events will set the framework for global action on the world’s most critical challenges after 2015. The opening plenary asked several city and corporate leaders to share their vision on why urban and transport issues need to be at the center of international dialogues for shaping the SDGs and a climate change solution. The panelists included Hubert Julien-Laferriere, Grand Lyon; Manish Bapna, World Resources Institute; Csaba Kőrösi, Hungarian Ambassador to the United Nations; Mahmoud Mohieldin, World Bank; Jeff Rhoda, IBM; and Tariq Kabbage, Mayor of the City of Agadir, Morocco. The plenary was moderated by Femi Oke, Al Jazeera. 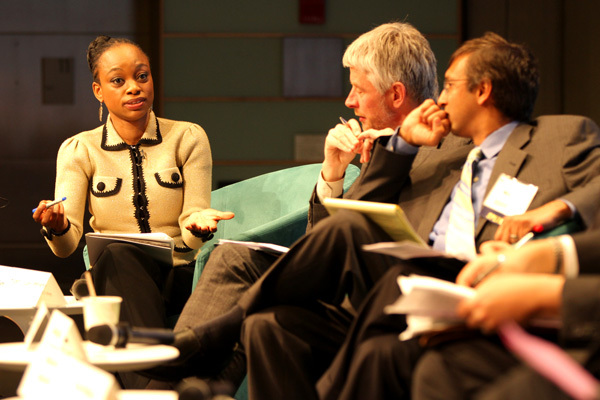 From left to right: Femi Oke, moderator; Hubert Julien-Laferriere, panelist; and Manish Bapna, panelist, during the Transforming Transportation 2014 opening plenary. Photo by Aaron Minnick/EMBARQ. We want to change the culture of how people see their cities and how they move in their city. Cities are at the heart of the solution for the upcoming SDGs…and public policy in cities is the key to the solution of climate change. There is exclusion from the workplace simply because people don’t have a way to get there. We can’t leave people behind when it comes to transport…it is key to creating jobs and sustainable livelihoods. The second plenary of the morning, “Enhancing Transport with Technology,” featured presentations from four transport and technology experts: Gyengchul Kim, Korea Transport Institute; Paul McRoberts, Autodesk; David Pickeral, IBM; and Balaji Prabhakar, Stanford University. Kim opened the session by presenting a case study of transport in Seoul, South Korea. Seoul began experiencing rapid urbanization in the 1960s and 1970s, which led to insufficient public transport capacity and severe traffic congestion by the 1990s. Today, Seoul’s public transport ride share comprises 65% of all trips made in the city. This shift was made possible due to several technological innovations prioritized by Seoul’s transport operators, including the use of GPS to manage intervals between the city’s 10,000 buses, smart card fare integration – which allows passengers to pay for public transport using their credit card or mobile phone – and providing real-time user information. Seoul has also focused on road safety to alleviate the negative socio-economic consequences of road crashes and fatalities. Through implementing speed cameras, intersection cameras, and “car black boxes,” accidents have decreased by 17.2% and fatalities by 22%. These are all valuable lessons other cities and countries can look to regarding the benefits of integrating technology into transport systems. 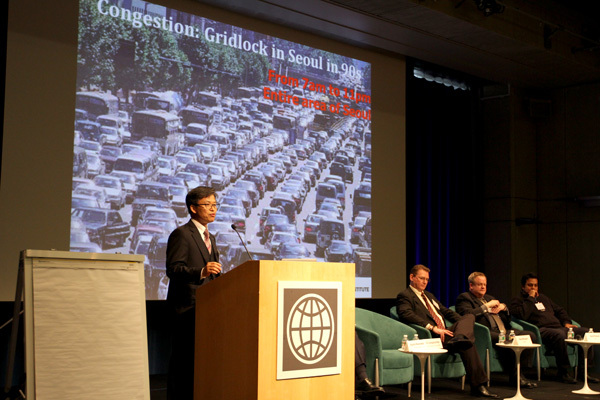 Gyengchul Kim presents a case study of Seoul, South Korea’s technological innovations in the transport sector during the technology plenary at Transforming Transportation 2014. Photo by Aaron Minnick/EMBARQ. Pickeral’s presentation, titled, “New Technologies to Shape the Future of Transport: It’s About the Data,” emphasized a thesis that data is the real innovation of 21st-century transport. “We can now measure in a way we’ve never been able to before in all of human history,” he said. The presentation focused on modal optimization – how to enable mobility with the assets we already have. How do you enable mobility rather than keep buildling things and expecting people to use them? In the 21st century, it’s going to be more about finding out where people are and getting them to where they need to go. In cities from Istanbul, Turkey, to Dublin, Ireland, IBM has been working to enhance modal optimization by using “anonymous demographic data” – information that can help steer investment from unnecessary construction or capital upgrades to other community improvements. The final presentation by Prabhakar explored an innovative approach to building relationships between commuters and transport operators – a platform called Insinc. Insinc incentivizes “good” commuting behavior, such as riding public transport, by offering users the opportunity to win monetary rewards. With over 100,000 users, Insinc’s success underscores the power of real-time rewards made available through a combination of new technologies and social nudging to incentivize behavior shift. Halfway through Day 1, the conference is moving at full steam, stimulating discussion and debate on how to shape the future of sustainable transport for cities. Check back on TheCityFix for our wrap-up of Day 1 later today. Stay tuned for continued coverage of Transforming Transportation on TheCityFix today and tomorrow – and join the online discussion using hashtag #TTDC14. Tags: data, EMBARQ, Kyle Mackie, North America, sustainable cities, sustainable urban transport, technology, The World Bank, Transforming Transportation, TTDC14, United States, urban development, Washington, D.C.